• Bachelor of Nursing Students. • Diploma of Nursing students. Apply theory to practice with the Clinical Cases textbook series! Janine Bothe’s Clinical Cases: Medical-Surgical Nursing Case Studies is part of the Clinical Cases textbook series, which offers nursing students a collection of scenarios that are common in a variety of practical settings. Some of the topics covered in Medical-Surgical Nursing Case Studies include: Cardiovascular, Gastrointestinal, Musculoskeletal and Respiratory in relation to medical-surgical nursing. The Medical-Surgical Nursing Case Studies textbook is complete with multiple choice questions throughout the chapters so you can revise and test your knowledge as you progress through the text. Best of all, use Bothe’s nursing textbook alongside Lewis’s Medical-Surgical Nursing, 3rd Edition by Diane Brown and Helen Edwards to really excel at your Diploma and Bachelor of Nursing courses. Benefit from the logical structure of this nursing textbook. Medical-Surgical Nursing Case Studies features a clear introduction that explores an existing condition and outlines its symptoms. Further details are then provided to help you form a more complete context, including: patient’s conditions, tests, medications and other considerations. Each case study within this nursing textbook provides a thorough conclusion that examines patient outcomes and the case’s key points. If you enjoy learning from real life cases, the Clinical Cases textbook series is the perfect educational suite to support your nursing education. 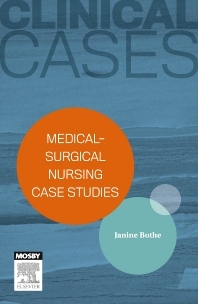 Janine Bothe’s Clinical Cases: Medical-Surgical Nursing Case Studies is perfect for use during exam preparation or as a study tool, providing an engaging approach to learning and revision. Browse other titles in this series to enhance your knowledge of core nursing skills and theories. • 22 case studies covering the body systems. • Multiple choice questions to test your knowledge throughout the textbook. • Rationales provided for all answers. • References for further reading and research. • Designed as an exam preparation and revision tool.